St. Ciaran's Cormac Donelly shots for goal under pressure from St Louis' Tiarnan Quigg during Saturday's MacLarnon Cup semi-final. St Ciaran's Darragh Canavan and St Louis' Shea Madden battle during Saturday's MacLarnon Cup semi-final in Ballinderry. St. Ciaran’s, Ballygawley made history at Ballinderry on Saturday when they had three points to spare over St. Louis Ballymena to qualify for their first Danske Bank MacLarnon Cup Final. 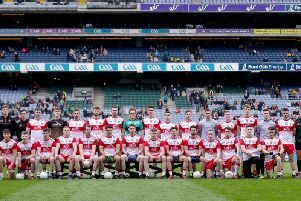 The Tyrone lads enjoyed a good start and were in early control but they failed to drive home their advantage and in fact trailed by a point at the break. Early in the second half they missed a penalty but didn’t let it deter them and after their opponents got a second goal, the winners finished strongly to book their place in the St. Patrick’s Day showpiece where they will face Our Lady’s Castleblaney. St. Ciaran’s were out of the blocks quickly with Caoimhin O’Donnell, Pascal Donaghy and Tomas Hoy all on target inside the opening eight minutes. A well taken long range point from midfielder Ronan Kelly then opened St. Louis’ account but back came St. Ciaran’s with efforts from Hoy and Darragh Canavan as they established a 0-5 to 0-1 advantage by the 23rd minute. Kelly then got his second point of the game before the same player levelled matters when he punched in a goal. St Ciaran's Tomas Hoy struggling to gain controldue to the pressure from St Louis' Conor Kinsella during Saturday's MacLarnon cup semi-final. O’Donnell and Aaron McNeilly exchanged points before St. Louis had the final say of the half from a Kelly free for a 1-4 to 0-6 interval lead. Kelly and Daniel Millar exchanged points on the restart before the latter sent over the equaliser after four minutes. Sixty seconds later St. Ciaran’s were awarded a penalty when Hoy was fouled but O’Donnell sent his spot kick wide of the target. Another free from Kelly edged Ballymena back in front but that was as good as it got for them. Donaghy, and three in a row from O’Donnell, left St. Ciaran’s leading 0-12 to 1-06 going into the final quarter. Cormac Donnelly then got his name on the scoresheet and when O’Donnell tagged on another point all the momentum was now with St.Ciaran’s. All that changed though when a point from Kelly was followed by a goal from substitute Darragh Fegan to reduce the gap to the minimum with three minutes left to play. St. Ciaran’s didn’t panic and points from Donaghy, Pauraic McNelis and Donnelly saw them into the final where they will face Our Lady’s Castleblaney.